With this toolbar you have both: a compact surface, which simultaneously shows you the most important information you need for trading. 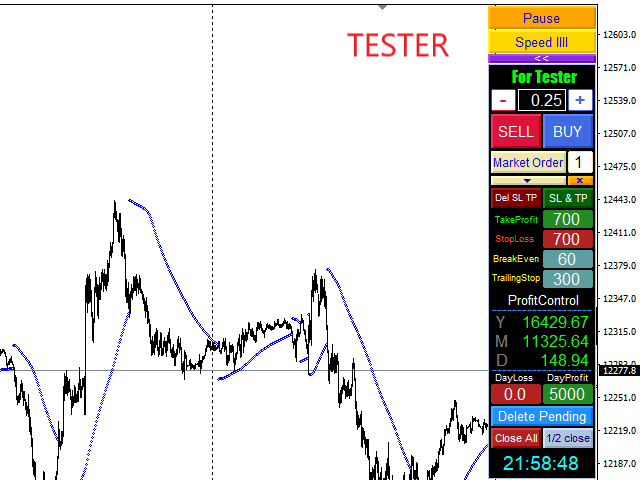 You can use it with your real account or also in the strategytester mode. This toolbar allows you to trade in the strategytester as real as possible with every option available from the MT4 platform. Magic Number - When the 'MagicNumber' number is 0, the toolbar will watch all orders without a 'MagicNumber'. If the number is set higher than 0, then only those will be followed, who were also created with this toolbar. Expiration of pending orders in minute - Timer in minutes. After its expiration the PendingOrders are deleted. Day Profit Close – Day Profit number, which closes all orders being followed and shuts down the function for the day (green letter D). If a continuing of trading is wished, the number should be changed to a higher one. The number can also be changed in the "Day Profit" field. Day StopLoss Close – Loss number, which closes all orders being followed. Set Round of 1/2 lots closing - a part of the position is closed, with an even number - the half. An uneven number lead to round down in the adjusted direction. The default setting closes the biggest part, e.g. after round down, a part of the lot size 0,05 will be closed with the lot 0,03 while 0,02 stays open. LastBar Line – switch off the vertical line, which is shown from the last closed bar. "SL & TP" - New parameteres can be set in the input field. (To realise them, you have to click on "SL & T” afterwards ). "Close All" - all market orders are closed, all pending orders are deleted. 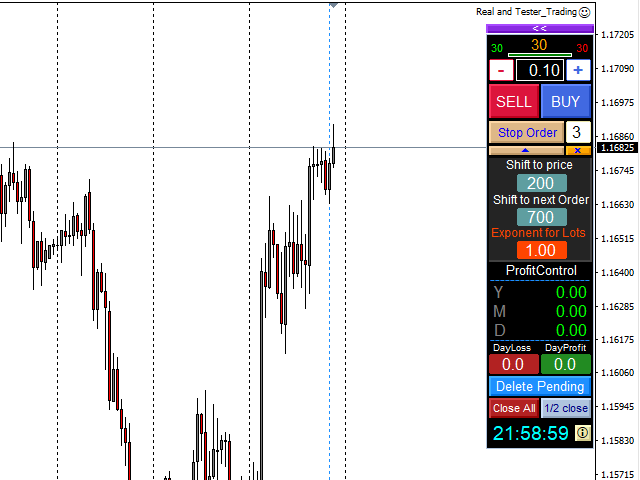 When market orders are created, a display will appear on the right side with its lot size and its profit. By clicking on it the order will be closed. "Pause" stops the test run. This can be used to set new parameters and to sketch with the tool. "Speed" changes the speed of the chart building. If faster than needed, the build-in regulator of the strategytester can be used. 'Stop' and 'Take' levels are adjusted just like in the real account. You can change them by dragging these points with the mouse in the direction you need, or by entering new parameters in the input field and click on "SL & TP". The tool displays the brokertime. Частично изменён расчёт лота в связи с тем, что у одного из брокеров данные минимального и максимального лота стали одинаковыми. В конкретном случае 10000 лотов. Что вызвало ошибку расчётов. Изменены и расширены возможности при нажатии кнопки под кнопкой Маркет ордер. Теперь можно выставить общий тейкпрофит и стоплосс по всем ордерам одного направления торговли. Также появились кнопки для общего закрытия всех сделок ,находящихся в прибыли или же всех сделок находящихся в убытке.